I’ll start looking for a payload guide. If they want paying customers, or at least payloads made out of company, they’ll need to tell us how to integrate our payloads with a Dragon, and how much money we need to show up at the door with. They need to stop thinking about Mars so they can keep focused and stay on schedule like SLS/Orion…. The thing is – this was his dream that got the whole thing started. If he thinks he can do it, he will. You’ve been in the sun too long. It was sarcasm. That’s some top quality snark right there…. I got that part of it. The part I’m trying to relay is that the entire engine and rocket development program sprang out of his desire to plop a small greenhouse onto the surface of Mars. He’ll try it the second that he can. It may not be 2020, but it’s a personal thing with him. A goal on a checklist. The goal was not to put a green house on Mars. The goal was to inspire the world/usa to give more money to NASA so they would go to Mars. How naive that young man was! I would say he inspired nasa alright. Well I was around back then, and long before, and I was heavily involved in these kinds of topics, so I can split hairs on this with the best of them. My memory may be faulty because I was living in political exile on a small desert island at the time, and my circle of billionaire friends were not West coast types. Let’s just say they had very very different interests. So my gig was just keeping them alive on their vacations. It was hard enough on Earth, can you imagine how hard that would be on Mars? Well I did. Every hour of every day, day after day for years. But I did follow West coast billionaire developments eagerly. As I recall, once he couldn’t get NASA or the Russians to play, he decided to go it alone with Tom Mueller, but the underlying premise was launch vehicle propulsion development. Back then there was a lot of conflicting information and opinions on how this should proceed. Legacy lego toys or all new hardware. The same problem also applied to missions and I have no real insight on how he came up with this one, but likewise I can imagine how – The usenet and occasional leaks. It would be probably a good idea, once human missions are heading towards the red planet, that they go in tandem (the crew of Apollo 13 were fortunate to have the LEM). And Mars is notorious for turning perfectly good spacecraft (almost perfectly good) into scrap metal; well, at least many of them that make the attempt. And science and technology are notorious for continuing to progress after, in spite of, and because of, all of those crash and burn experiments and failed hypotheses. Their constant comercialization is even more remarkable. Given the news of the accident with the SLS fuel tank on NASA Watch there will probably be a delay of first flight for a couple more years. So for Mars this is probably the only game in town. In terms of HSF, one thing I was wondering about is the old Dennis Tito flight around Mars. Its actually covered in his biography. It also covers the influence Dr. Griffin had on this thinking of rockets. You’ll just have to forgive me for passing on that. I’ve got a life of my own. Can that entry data really be worth $30 million to NASA ? Or is there someone at NASA that is just looking to give SpaceX the use of valuable resources at a almost zero cost ? Its a good read about his plan to save humanity and fight global warming. Been there, done that. I’ve even got a bunch of t-shirts to prove it. To address your deleted comment, I gave up those kinds of things when the usenet died. Nowadays, besides my post Sputnik Disqus comments, I prefer to speak with billionaires directly. So don’t call me. I’ll call you. Thanks. Anything I think you really need to know, I’ve blogged and published already. Same old “ball of sunshine” that you used to be on Usenet News. That was google groups, until they banned me. Dragging hominids kicking and screaming into the future is hard work, and that kind of work is not for everyone. The sci.space groups were and still are Usenet Newsgroups. Google Groups is nothing more than a fancy interface to them. So, yes, you’re the same guy. Then say hi to all of them for me, I know there were some standouts, but I can’t remember their names mostly, just their ideas and lovely and crazy comments. I know Pat died a while back. The last I checked it was mostly cranks and bots and essentially unreadable. Modern AJAX commenting sure has come a long way. We’re already being overrun with fake comment bots. was it not you that suggested I just block that ‘ball of sunshine’? actually, all planets and the moon does that. exactly. 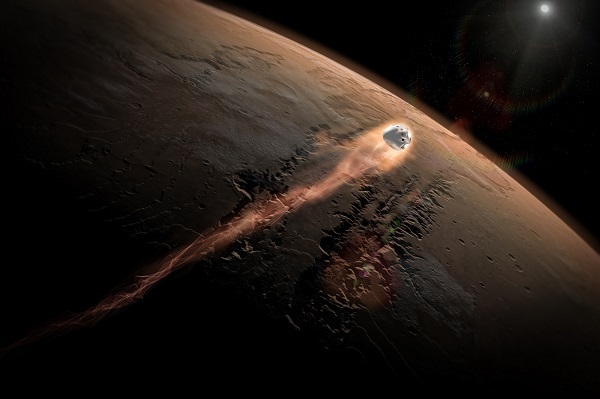 Ideally, send a slow cargo ahead to mars and have it hit mars about a month after the crew. That way, if need be, there is a safety vessel along the way. Show me another way NASA can get said data for less than $30 megabucks and I’ll concede you have a point. Absent that, it’s just the usual SpaceX bashing. hey, sometimes it is funny to listen to idiots like that.